Mines is working on Windows 10!!! Seems Windows 10 has erratic behaviour. 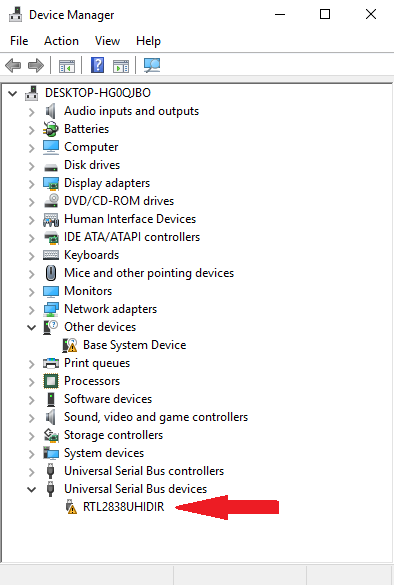 May be Win10 does not treats all USB ports equally. To test this, on my PC, I will plugin the FlightStick in all the USB ports one by one and see if Win10 can pick the FlightStick on any of the USB ports. Ok, I think I have this nailed down. On my one system I was able to very easily switch to the WinUSB driver using ZADIG but on my other two system I completely failed. ABCD567’s post reminded me that these RTL devices should be treated as a composite devices and the ZADIG needs to replace the driver for the composite, not the two individual devices. Normally, the FlightStick will show as two devices in Device Manager. If the automatically downloaded drivers from Microsoft are used the Flightstick will be seen as a HID Infrared Remote Receiver under Human Interface Devices and as a Realtek 2832U device under Sound, video and game controllers. The trick to getting this to work is of course ZADIG. 3. IN Options -- Check "List all Devices" , UNCHECK "Hide Hubs or Composite Devices"
8. Start RadarBox and your FlightStick should be discovered. You two have succeeded with zadig on Win10. I and many others have failed. I have Win10 Home, and failed. Which version of Win10 you have? Thanks for providing detailed guide with screenshots. (1) I uninstalled all the USB Hub devices, then rebooted Win10, then installed Zadig. (1) When I uncheckmarked "Ignore Hubs or Composite devices" in Zadig, I could see Composite USB device RTL2838UHIDIR, and I selected it for driver installation in Zadig. I tried your method several times, but Windows 10 is extremely stubborn, and all my attempts failed. After I clicked "Replace driver"in zadig installer, WinUSB driver was installed and my zadig display became exactly like yours, but in the "Windows Device Manager" there is a caution mark besides the dongle (see 2nd screenshot I have posted), and the AN software does not detect the dongle.